The "night out" went OK. The place was packed to start with with mainly a big party of millennials. However the overall mix of people was pretty evenly mixed. 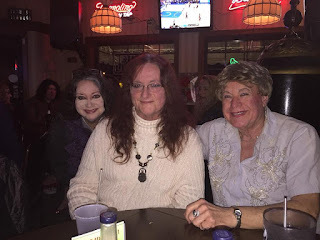 As we came in and waited for the hostess to try to find our party, I did get a few looks, but nothing out of the ordinary. We finally found our group and settled in. For once I didn't say anything real stupid and got a picture. To the left, you will see Liz and I with Jill. I was geeking all over her because she is a retired train engineer. I am a huge train fan. Some of the group even "sang" Karaoke. All I can say is they are much braver than I! Although Liz and I had to leave fairly early, everyone in the group seemed to conduct themselves in a proper manner. I was pleased!